SDE can employ a variety of advanced Computer Aided Engineering (CAE) and analysis techniques to assist customers across a wide range of industries in the research, design & development of mechanical products and systems. 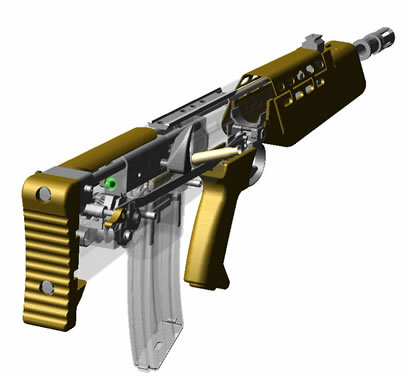 Specialising in kinematic modelling of complex mechanisms, SDE’s engineers can also apply a range of other industry standard software tools and processes to fully support the design process from concept development through to conducting trade-studies and undertaking detailed design and verification. 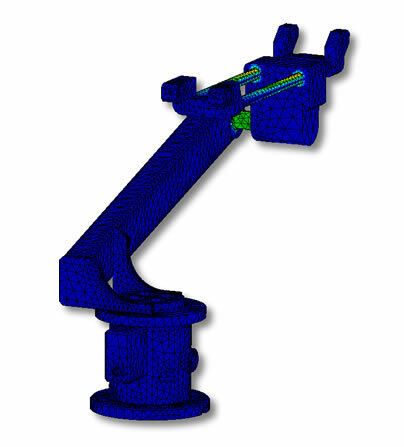 Kinematic Modelling or Multibody Dynamics Simulation is a computational modelling technique which can be used to study the interaction of components within complex mechanisms. 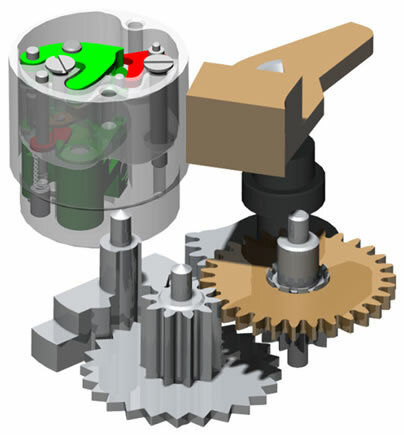 3D CAD geometry for the system can be imported and connections between the parts represented by joints, which remove the relative degrees of freedom. Internal and external force constraints, such as point-loads, linear spring-dampers, 3D contact, gravity and friction can also be applied to construct a ‘working model’ of the system. 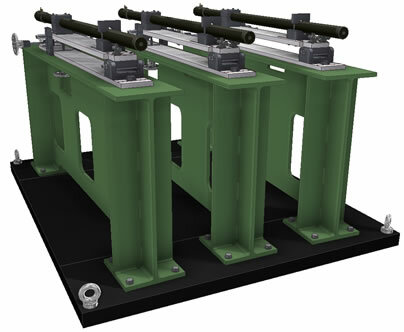 SDE has developed significant expertise in application of kinematic modelling techniques to assist in the design and development of a wide range of mechanical systems. 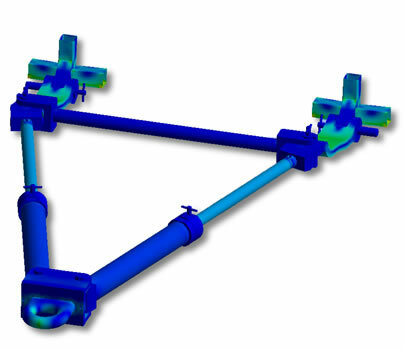 Using state of the art Multibody Dynamics Simulation software, SDE can quickly build a virtual prototype of the mechanism and investigate operation under a variety of load cases. Parametric studies can also be conducted to establish the effect of changes to key design parameters and the results used to optimise the system, significantly reducing the number of test serials required in later stages. In mechanical systems involving a large number of components and complex load cases, dynamic design verification using traditional hand calculations may provide significant challenges to the design engineer. Furthermore, physical prototyping and testing of multiple design iterations can introduce significant time and cost burdens to the development programme. Using 3D CAD geometry, SDE can quickly produce a kinematic model of the mechanism and apply representative load conditions in order to study the dynamic operation of the system. Results can provide detailed feedback on the motion history of all components within the model, allowing design issues to be quickly identified. In addition this enables animations to be created for use in presentations, training or marketing material. SDE has been involved in conducting kinematic modelling of mechanical systems for almost a decade. In many cases it has proven to be an invaluable tool in developing a thorough understanding of the system dynamics, particularly in cases where detailed instrumentation of physical tests is constrained by the operational environment. A key benefit in the use of kinematic modelling is the ability to conduct parametric analyses to understand the effect of modifications to design variables on the operation of the system. SDE can configure the model using sensors, measures and objectives to automate the investigation and also to conduct goal seeking to optimise the key design parameters (E.g. 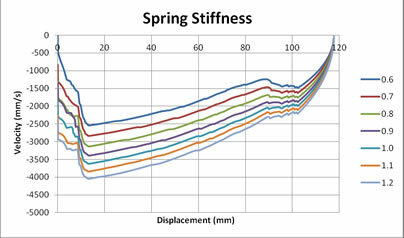 spring constants, component masses, frictional coefficients) based on performance requirements. Automation of this process allows us to deliver exceptional value for money for our customers, whilst conducting the large number of runs required to guarantee a rigorous analysis. In cases where part flexibility has the potential to affect the dynamic operation of the mechanism, SDE can consider key components as flex-bodies. Integration of flexible bodies into a kinematic analysis can offer a number of potential advantages, including enabling component deformations to be studied, prediction of loads with greater accuracy and capturing the inertial and compliance properties during handling and comfort simulations. This capability has proven vital in the simulation of mechanical systems subjected to extreme loading conditions where the assumption of rigid-bodies has a detrimental effect on the accuracy of the results obtained. 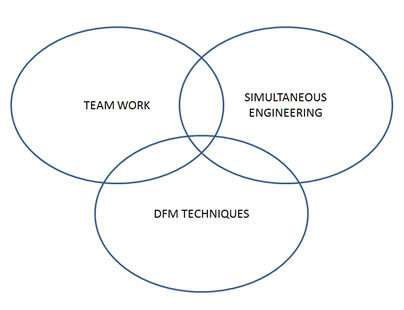 Mechanical design services form an integral part of SDE’s Design, Modelling & Simulation capability. 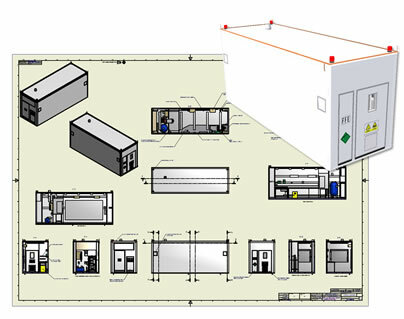 The company employs a number of skilled designers and experienced Computer Aided Design (CAD) draughtsman to provide assistance to our customers at all stages of the design process. The company is ISO 9001 registered and operates a comprehensive design and drawings database, ensuring optimum traceability and tracking of design changes throughout the development cycle. Engineers at SDE work with the latest solid modelling tools to create full 3D geometry, allowing design visualisation and identification of issues from an early stage (e.g. component interferences). CAD geometry can be exported in a number of formats for use in subsequent design analysis, such as Finite Element Analysis and kinematic modelling, or fully rendered to produce photorealistic images for use in marketing or presentation material. The ability to successfully manufacture a final design both reliably and in a cost effective manner, either on a small scale or as part of a mass production run, is key to any development programme and involves consideration of a large number of factors including tolerancing, ease of fabrication and minimising tooling complexity. A number of the SDE design team have experience in manufacturing environments, ensuring that DFM plays a critical role in influencing our design process from day one. This significantly reduces the amount of re-work required to achieve a production-ready design. Putting a design into production requires a comprehensive data pack to be compiled which fully defines the part or assembly to be manufactured. The data pack contains all information required to put the design into production, including drawing and item lists, general assembly and part drawings, and interface and material specifications. 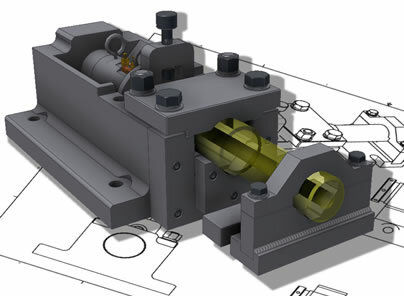 SDE can create 2D fully-dimensioned manufacturing drawing packs, either from a 3D solid model assembly or directly based on customer supplied data. Finite Element Analysis (FEA) is an established numerical method for analysing the response of complex engineering systems to internal and external loading conditions. The technique is based on discretization of the problem into a series of finite elements in order to allow an approximate solution for the overall system to be determined. 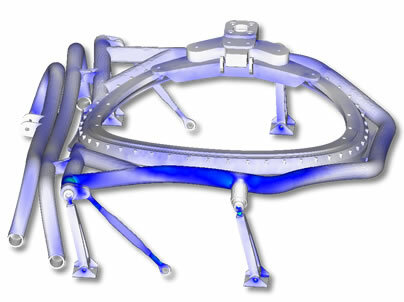 SDE can apply FEA techniques to assist in mechanical engineering design, product development and optimisation, and analysis of product failures, thereby offering large potential cost savings to our customers by reducing the requirement for time-consuming and often costly physical test programmes. 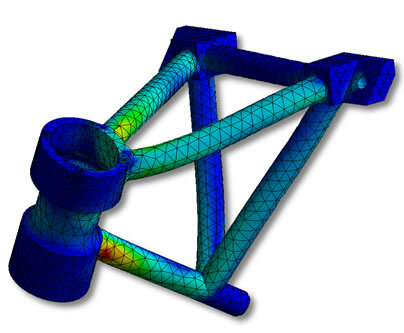 FEA can provide a rapid and cost-effective method for investigating the strength of design of mechanical systems. A variety of external loads and boundary conditions can be applied to represent the real-world operating environment and induced stresses and strains throughout the system can be quickly determined. Analysis of results enables any regions of stress concentration to be quickly identified and compared to material strength properties in order to highlight potential issues within the design. Using industry standard linear and non-linear finite element codes, SDE can undertake a variety of analyses to determine system, sub-system or component response to static or dynamic structural loadings. Applied at an early stage, results can guide the development process by providing quantifiable feedback to the design team on strength of design issues, significantly reducing product development timeframes by decreasing the number of physical prototypes and tests required. Modal analysis is a technique by which the natural mode shapes and frequencies of an object or structure can be determined. Analysis of modal vibration is an essential part of the design process, since unwanted vibration in structures and mechanical systems can lead to discomfort, shorten equipment life and, in the worst-case, lead to catastrophic failure. Despite this, vibration analysis is an area which is often disregarded. SDE can perform detailed modal analysis of structures, components and assemblies using finite element methods in order to determine the natural frequencies and mode shapes. Through comparison of results against customer requirements we can identify any areas of potential concern and make recommendations for design improvements. In addition, SDE can perform forced vibration analyses in order to examine the effect of a variety of external forcing functions (sinusoidal, random, etc.) on the overall response of the system. Through use of forced vibration analyses, SDE can investigate the effectiveness of various design modifications in order to tune the effects of vibration, as required. 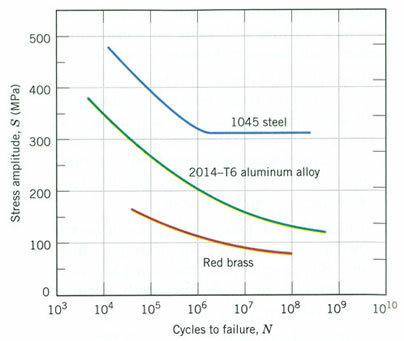 Fatigue occurs when a component is subjected to cyclic loadings in excess of a threshold level, but often significantly lower than the material yield strength. Over time, cracks begin to develop within the material microstructure and these create regions of stress concentration. Eventually these cracks coalesce, reaching a critical size, leading to prompt fracture of the component. 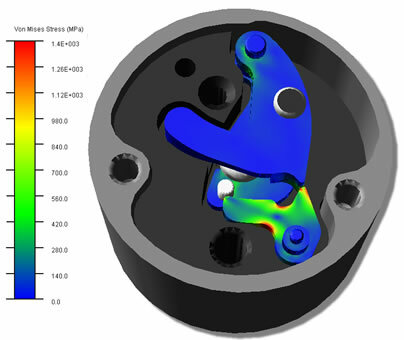 Using FEA techniques SDE can predict the response of a mechanical system to various loading scenarios, identifying regions of elevated stress and comparing results to material Stress vs Number of Cycles (S-N) curves in order to estimate fatigue life. If results indicate fatigue life issues, SDE can work with the customer to investigate design modifications in order to resolve the problem. The process of design optimisation is critical in the development of any new product or system in order to ensure that manufacturing costs are minimised without compromising on in-service performance and reliability. Due to the iterative nature in which design modifications must be implemented and tested, design optimisation can be particularly labour intensive. SDE can employ optimisation algorithms to automatically determine optimum configurations through variation of a number of design parameters including the profile and dimensions of the component, material properties and applied loads. This ensures that minimal manual input is required to achieve an optimised design, resulting in a process which can not only offer substantial reductions in development time but also exceptional value for money.